This data set reports the results of a vegetation survey along transects across the transition zones between the three major forest types in the seasonally dry forest of the southwestern Amazon Basin in the municipality of Juruena, Mato Grosso in 2004. The major forest types are differentiated by tree species composition, biomass, soil type, and landscape position: (1) campinarana; high stem density and low biomass on sandstone outcrops, (2) palm forest; low-lying seasonally inundated areas dominated by palms and, (3) terra firme; low stem density and high biomass. Along these 10 x 100 m transects, all trees, palms, and lianas >= 10 cm DBH in 10 x 10 m plots and, in nested 2 x 10 m subplots, all trees, palms and lianas >=1 cm DBH were measured, identified and georeferenced. Plot locations and survey data are reported in two comma separated files. Figure 1. Study location in Juruena, Mato Grosso, Brazil. The 1400 ha study area outlined in dashed white line is situated within the 25,000 ha Fazenda Roshmar logging concession outlined in black on the LANDSAT image. The Juruena River is seen to the east of the study area. From Feldpausch et al., 2005. Elucidating the factors that contribute to spatial dynamics in forest composition and structure can help inform forest management protocol, improve biomass estimates and explain controls on biocomplexity. In this study we analyzed the soil and landscape controls affecting forest attributes in the seasonally dry southwestern Amazon, Fazenda Roshmar logging concession in the municipality of Juruena, Mato Grosso. Three major forest types differentiated by tree species composition, biomass, soil type, and landscape position were identified: 1) campinarana; high stem density and low biomass on sandstone outcrops, 2) palm forest; low-lying seasonally inundated areas dominated by palms and, 3) terra firme; low stem density and high biomass. Using Landsat imagery and ground surveys, transition zones between eco-types were identified and six 10 x 100 m transects were established along transitions. Each vegetation type is represented by approximately two transects. Along these transects, all trees, palms and lianas >= 10 cm DBH in 10 x 10 m plots and, in nested 2 x 10 m subplots, all trees, palms and lianas >=1 cm DBH were measured, identified and georeferenced. 9 Subplot Each plot was divided into two subplots: 1= is the first 2 x 10 m subplot and all stems >=1 cm DBH were measured; 2= the remaining 8 x 10 m subplot and all stems >=10 cm DBH were measured in this subplot. 21 Branching_height m For trees, height to first major branch in meters (m). For palms, height to first leaf in meters (m). 22 Total_height m For trees, height to top of crown in meters (m). For palms, height to base of top leaf in meters (m). The data set covers the period 2004/06/05 to 2004/07/20. Most data sets on biomass in tropical forests ignore life forms other than trees and frequently ignore trees with diameters less than 10 cm. Our information on the amount and distribution of biomass in these systems is thus systematically biased because it includes other life forms and small diameter trees. The data reported here can be used to analyze spatial distribution of plant species and plant life form as well as the distribution of biomass between trees, palms and vines in a tropical forest. There is some known error associated with the GPS waypoints on the order of 5-15 meters. Similarly the diameters reported have an associated error of 0.2 cm. Three major forest types differentiated by tree species composition, biomass, soil type and landscape position were identified: 1) campinarana; high stem density and low biomass on sandstone outcrops, 2) palm forest; low-lying seasonally inundated areas dominated by palms and, 3) terra firme; low stem density and high biomass. Using Landsat imagery and ground surveys, transition zones between eco-types were identified and six 10 x 100 m transects were established along transitions. Each vegetation type is represented by approximately two 10 x 100 m transects. All trees, palms, and lianas >=10 cm DBH and, in nested 2 x 10 m plots, all trees, palms and lianas >=1 cm DBH were measured, identified and georeferenced. Table from Jirka et al. (2007). Schematic of the transects and plots within the study area. Note that this data set refers to "plots and subplots" rather than "subplots and sub sections". Feldpausch TR, Jirka S, Passos CAM, et al. 2005. 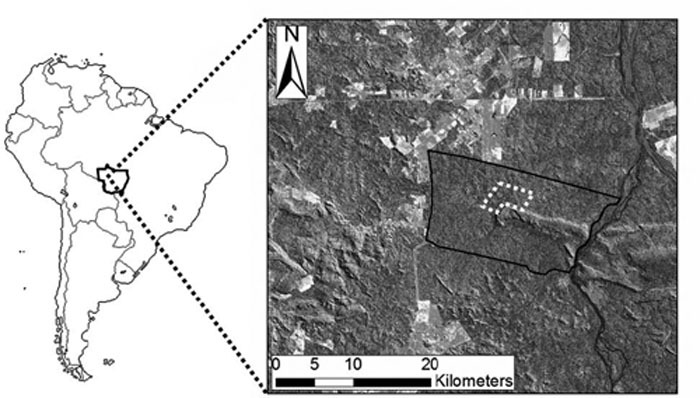 When big trees fall: Damage and carbon export by reduced impact logging in southern Amazonia. FOREST ECOLOGY AND MANAGEMENT 219: 2-3. 199-215. Jirka, S. 2006. Plant-environment associations and forest structure in the southern Amazon basin. Thesis. Cornell University.